Masters of Colombian folkloric cumbia, Los Gaiteros de San Jacinto, played Le Poisson Rouge on July 26 and it was a thing of beauty. 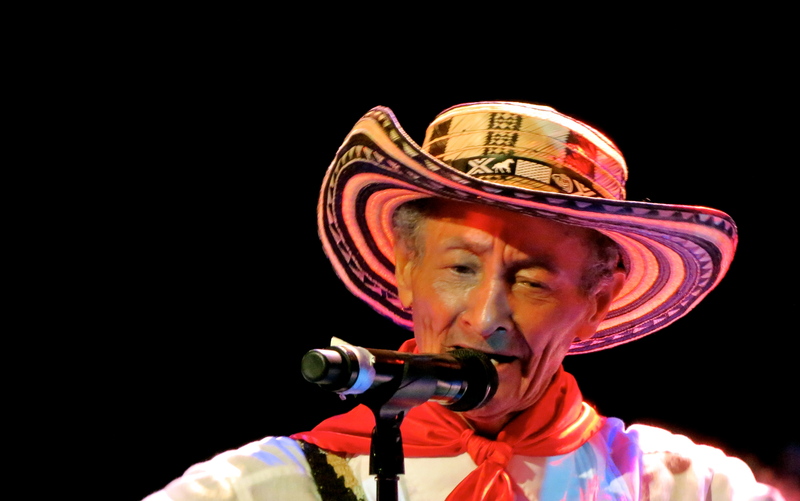 Lead singer Juan “Chuchita” Fernández may be in his 80s, but he shows no signs of slowing down as he consistently charmed the crowd throughout the nearly two hour performance. And, yes, that front row full of YOUNG LADIES. Geko Jones, one of the New York tropical scene’s hottest DJs, kept the crowd bailando with sets interspersed with classic Colombian tunes and, of course, various remixes that put a modern take on this amazing music. Check out his latest mixtape here. A second set by Los Gaiteros included special guest musicians, including some from M.A.K.U. Soundsystem, a Queens based, afroColombian punk, funk and jazz supergroup that I’ll be profiling in Sounds and Colours in the near future.